146 Fully Illustrated Pages showing step-by-step how to do the work and what tools and materials to use. and NFRC IVP Program . NEWLY UPDATED AND REVISED FOR 2017: 5 NEW SECTIONS. 10 SECTIONS EXPANDED CHAPTERS FOR COASTAL APPLICATIONS, TOO!. 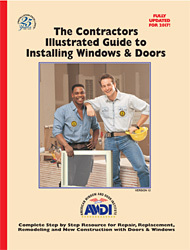 Available for the first time: a complete book showing how to install Vinyl Windows in every type of construction. This information is accepted by EnergyStar, EPA and NFRC and is available nowhere else. Also there's a full chapter showing step-by-step the proper way to measure an opening, and how to check for square; and a full chapter showing how to operateand maintain double-hung, slider, and casement/awning windows. You'll find illustrations and explanations of Outside-in versus Inside-out installations and when to use them; and a formula for determining how out-of-square an opening needs to be before you use a smaller window. This guide is complete and is used as a training book for AWDI Certification. The book is written in simple language and the photos and drawings illustrate each step. All instructions are based on the national AWDI Guidelines, and have been reviewed and approved by installers and window manufacturers coast to coast. Fill out the form below and we will mail this full size (8-1/2 x 11); 100 page, fully illustrated book to you. It is just $42.95 plus $5.60 shipping and handling.